I’m thinking these would make a perfect breakfast in bed for your Mom tomorrow. Or your Grandma, or Aunt, or Sister or any special woman in your life you want to show your love to. I recently found a hidden bag of frozen rhubarb I had forgotten about. Frozen rhubarb = gold for me. I took a simple muffin batter, filled it with the rhubarb and plopped a spoonful of strawberry jam in between the batter layers. Then I topped each with a crumble topping. These actually kind of reminded me of my Grandma Donna’s famous rhubarb cake (which I will share eventually, because it’s the best thing EVER). I love the burst of strawberry jam you get when you bite into the unassuming looking muffin. These are fabulous. I’d like to send an early thank you to my Mom for everything she does (and is) for me. My Mom had me when she was quite young and recently shared something on Facebook that tugged at my heart strings. She and I don’t talk about it a lot but I have definitely always known that having me young would have impacted her life in many ways. She talked a lot about her dreams to become a teacher when she was young but having me meant rearranging her plans and her path. She has never once though, made me feel as though she regretted having me or resented the impact my arrival would have had. Thanks Mom, for seeing me as a blessing and not a burden. Also, thank you for giving me my siblings. They are some of the greatest joys in my life. I have a lot of other ladies in my life to be grateful for too. I have a fabulous Mother-in-law who supports me in everything I do and has always welcomed me into her life as if I were her own daughter. My maternal Grandma, who has always been a rock in our family and who reminds me how important the simple things in life are. My paternal Grandma, who I’ve always been close with; I always feel like I’m home the second I walk into her house and her door is always open. 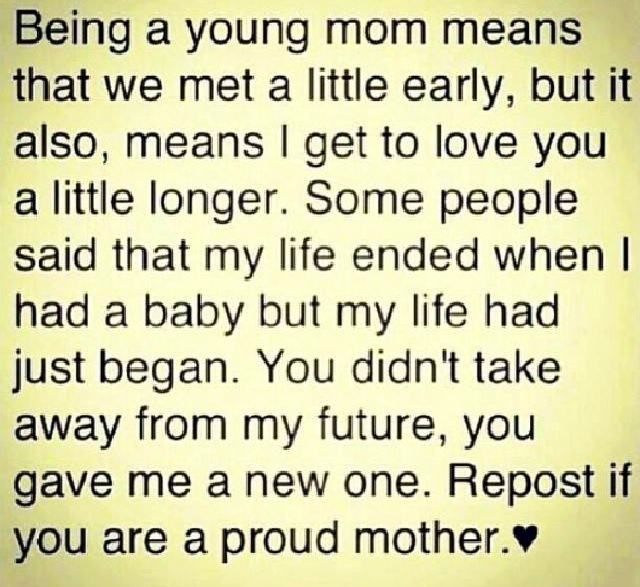 I also have several good friends who all became new moms in the last year or two. I am so impressed with how all of you have taken on motherhood. You make it look easy. Happy Mother’s Day! Let’s have muffins! Preheat oven to 350 degrees and line muffin tins with liners. Mix all ingredients together well until combined and crumbly (I just use my fingers). Set aside. Mix dry ingredients in a medium bowl and set aside. Mix wet ingredients together in a large bowl. Stir dry ingredients in with wet ingredients, being careful not to over mix. Stir in rhubarb. Batter will be very thick. Fill muffin liners halfway with batter. Drop 1 teaspoonful of jam on each. Then fill each liner the rest of the way with batter. 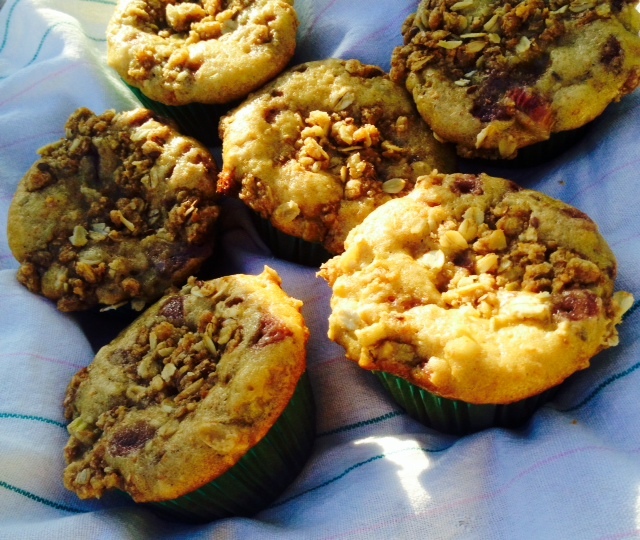 Divide crumble topping evenly on top of muffins. Bake for 20-25 minutes. Once cool, store in an airtight container. These freeze well.